Playing with the tradition pepper and egg sandwich. WHEN is a twist on something so different that it doesn’t resemble the original at all? This might be one of those times. 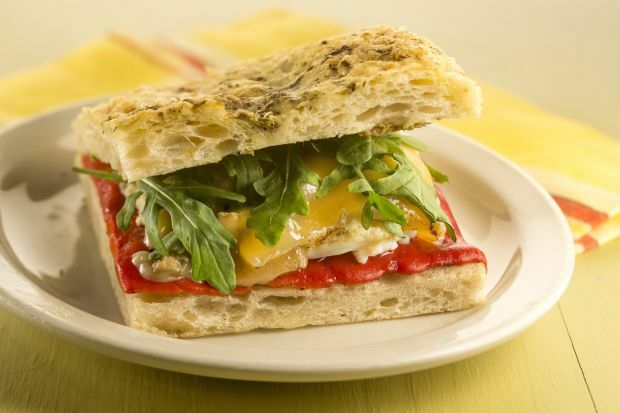 When Lenten observances demand a meatless meal, the pepper and egg sandwich is a favourite for its fat strips of sautéed green bell pepper nestled into mounds of fluffy scrambled eggs, all tucked into a crusty roll. Some would add giardiniera for heat and a tart contrast to the sandwich’s richness, but there’s not much reason to toy with it. This sandwich is like the original only in that it has an egg and a bell pepper and there’s bread. I played with each ingredient, then added a few for more fat, savouriness and freshness. If you like a runny yolk, you could make this a knife-and-fork sandwich, or just embrace the messiness. I like focaccia here, but if you don’t have a good source, another crusty bread, maybe a kaiser roll or ciabatta, would work well. One thing the sandwich lacks is some acid. But giardiniera seems, in my mind, a bad fit. To bring in some acid, I’d toss together a vinegar-dressed slaw to serve alongside. And then say penance for messing with a classic. Slice the focaccia in half horizontally. Spread the inside of the top half with olive spread. Place the roasted pepper on bottom half; top with the fried egg, then the cheese. Sprinkle with plenty of rocket leaves. Close with the top half of the focaccia.